I'm a fan of the political thriller genre. Not so long ago I was devouring episodes of Homeland as if my life depended on it. I recently read The Spy Who Came in from the Cold and loved it. So, it is perhaps natural that I should be so intrigued by the unfolding drama in Sichuan involving Chongqing Party Secretary Bo Xilai (left) and his erstwhile right-hand man, Wang Lijun (right), who until recently served as Chongqing's top cop and deputy mayor. For the past several days, the Internet has been pulsating with reports and speculation that Wang had gone to the US consulate in Chengdu to seek political asylum. It's been fascinating to watch this story unfold, especially to observe how details of a high-level political scandal that once would have remained practically unknown, save for some after-the-fact rumors published in the Hong Kong political press, has been exposed on the Chinese-language Internet, almost in real time. I'm not going to go into all of the background of this story or analyze its importance (except to remind you of this earlier posting, which may now need to be revised). Xujun Eberlein has posted what I believe to be a very plausible (and concise) account of what appears to have happened and why. Shortly thereafter, a series of posts appeared last night on the Twitter feed belonging to @lee91741 (who I don't know) that add (embellish?) details on the account as we know it. I've done a rough translation below. I don't vouch for the veracity of any of this, and in fact, there are some details of the story that don't make sense. Just think of this of the outline of a screenplay for the one-hour first episode of a television drama and enjoy it for what it's worth. 1. At 5pm on 6 February, Wang returned home to his residence. The men keeping him under surveillance reported: “All normal!” Then three of the six surveillance teams were dismissed, leaving three teams posted at the front and rear of the house, with one team on call. Each surveillance team consisted of three members. After spending half an hour observing the scene from his window, Wang decided that their guard had slackened. He then immediately made himself up as an old woman, started up a car that he had earlier fitted with normal license plates, and leisurely drove out [of the residence compound]. He then switched to license plates belonging to the Chongqing Public Security Bureau and sped off. 2. As he neared Chengdu, Wang used a disposable mobile phone to call the US consulate in Chengdu. “This is Chongqing Vice Mayor Wang Lijun. I would like to seek political asylum. I am about to enter the Chengdu city limits.” Thirty minutes later, at around 9pm on the 6th, Wang Lijun, the vice mayor of Chongqing Municipality, the People’s Republic of China, drove into the US consulate in Chengdu. 3. After having waited for several hours, US Consul General Peter Haymond* and several vice consuls met with Wang Lijun in a conference room. Wang immediately made a verbal request for political asylum. His proof of asylum: a photograph of one of Wang’s associates who had been secretly arrested and interrogated to death and a video of someone else describing Bo Xilai’s plan to have Wang Lijun murdered. These documents showed that the plot included suicide, a car accident, “disappearance,” and concoction of a trumped-up case in which Wang would be shot down while on the run. 4. After Wang had shared the details with the Americans, the US side told him: “We accept your request for political asylum, but the final decision will require us to report to Ambassador Locke in Beijing. Please understand.” At 11pm, Beijing time, US Ambassador Gary Locke received a telephone report from the Chengdu consulate. Locke immediately reported the details to the White House. During this time, the Americans arranged for Wang Lijun to communicate with his family by code to tell them he was safe. 6. Wang Lijun explained to the Americans: “I came to hide in the US consulate in order to evade political assassination by Bo Xilai.” After discussion, the Americans came to believe that this was the only reason that the Chinese side could accept. At 8am on the 7th, Beijing time, Ambassador Locke notified the Chinese government. The Chinese side immediately sent the State Security Bureau to fly to Chengdu. Their mission: safely retrieve Wang Lijun and, on account of Wang, thoroughly investigate Bo Xilai, [Chongqing Mayor] Huang Qifan, and their subordinates. 7. At 7am on the 7th, Beijing time, the surveillance team realized that Wang had disappeared. 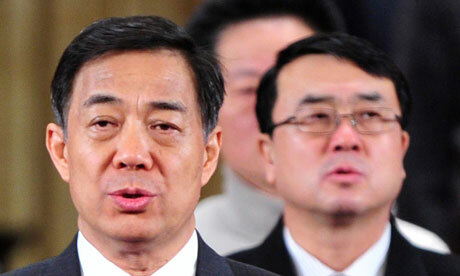 Bo Xilai immediately got in touch with his contacts in Beijing and learned that Wang Lijun had gone to the US consulate in Chengdu. He immediately directed Huang Qifan to take 70 police vehicles and set off with great despatch to Chengdu. Finding themselves surrounded by the Chongqing police, the Americans in Chengdu immediately contacted Ambassador Locke in Beijing, who notified his Chinese counterparts that Chongqing police were surrounding the US consulate in Chengdu. 8. Party Central was furious on hearing the news and immediately ordered the Sichuan party secretary to ensure the safety of Wang Lijun and US consular officials and to order Sichuan state security and police into action to drive away the Chongqing police and wait for officials from Party Central to arrive on the scene to handle the affair. At 12 noon, Beijing time, the Chongqing police force led by Huang Qifan was driven out of Chengdu. At 2pm, Guo Qiang and his crack team from the Chinese Ministry of State Security arrived in Chengdu and took over operational command. 10. Between 4:30 and 5:30pm, Wang Lijun met alone with the US consul general for an hour and gave the Americans some documents. Then at 6pm on the 7th, Beijing time, Wang Lijun walked out of the US Consulate General in Chengdu on his own. At 8am on the 8th, Beijing time, Wang Lijun was personally escorted to Beijing by a vice minister of the Ministry of Public Security. Good News About Residential Surveillance? What Happens During "Residential Surveillance"?